Ken Bones' first television appearance was in the BBC Jubilee Play "A Day in the Life" by Ray Connolly, in 1977. In 1980 he appeared in an episode of Fox as Kemble. Bones played Sergeant Parkes in an episode of Spearhead (1981), played a small role in Series 3 of the long running TV series, The Bill (1987), Paul Roussillon in Bergerac (1988), and a Superintendent in London's Burning (1988). Also in 1988 Bones played Victorian medium Robert James Lees in ITV's Jack the Ripper starring Michael Caine. His first feature film was Bellman and True (1987) directed by Richard Loncraine and starring Bernard Hill. The New York Times film critic said "Mr Bones makes a memorable screen debut as the bullying Gort." In 1995 Bones played Toussant in the film Cutthroat Island, and in 1998 made appearances in Dangerfield and Cold Feet. 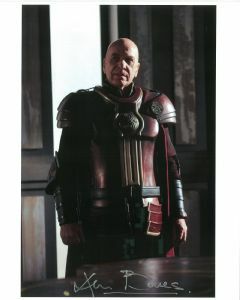 He played Admiral Bill Wilson in the 1999 film Wing Commander, and in 2001 he played Banquo in a made-for-television film of the Royal Shakespeare Company's Macbeth which starred Antony Sher as Macbeth. The film was the televised version of a stage show which had an enormously successful run in Britain, Japan and the United States. In 2002 Bones played Keith Burns in an episode of Spooks and in 2003 appeared in Casualty as Robbie. His 2004 roles include Hippasus in the film Troy starring Brad Pitt, Mr Mansell in Heartbeat and Assistant Commissioner Bob Mullen in New Tricks. During recent years Bones has appeared in Doctors (2007), Holby City (2008 and 2010) and The Bill (1987-2009) as DCI Ted Ackroyd, as well as in the film Perfect Hideout (2008) starring Billy Zane. In 2009, he played Erasmus in Henry VIII: The Mind of a Tyrant, and in 2011 he appeared in the six-part series The Hour. He has also played a character named Sethius in popular CBBC television series Young Dracula. Ken Bones portrays Lord Halifax, British Foreign Secretary from 1938 to 1940, in 2012's Season 2 of Upstairs Downstairs, the 2010 British television series. He appeared in the Doctor Who 50th Anniversary Special The Day of the Doctor as The General in 2013, and reprised the role in the Series 9 finale Hell Bent (2015) before passing the role on to T'Nia Miller. Bones played Publican No. 7 in The World's End (2013), and the same year it was announced that Bones had joined the cast of Atlantis. His most recent film appearance was as an Egyptian scribe in the 2014 epic Exodus: Gods and Kings. In 2016, he appeared in the TV series Medici: Masters of Florence.